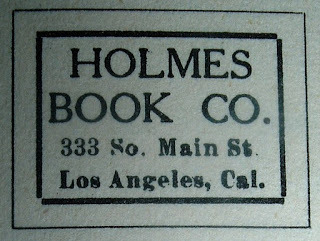 Last year, I posted to this blog about a book-related piece of ephemera with a very weak link, if you could even call it that, to the Thanksgiving holiday we celebrate today in America. 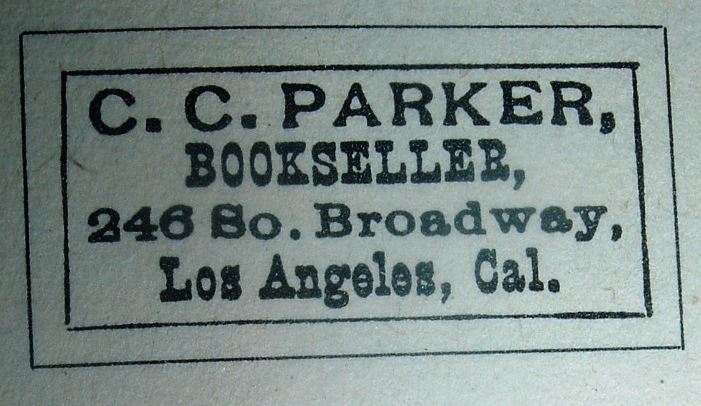 It was a blotter for the Pilgrim Bookshop in Brooklyn, NY. Pilgrim was as close as I could get to Thanksgiving. Told you it was weak. 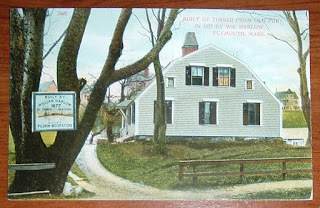 I also lamented that the bookshop wasn't in Plymouth, Massachusetts, for at least then it would have some connection to the Pilgrims and the first Thanksgiving celebration. 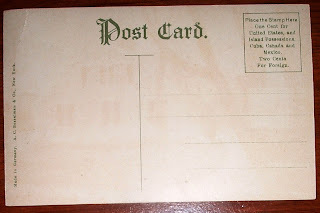 This year, I have a better connection--a postcard from the Guides Pilgrim Bookstore. 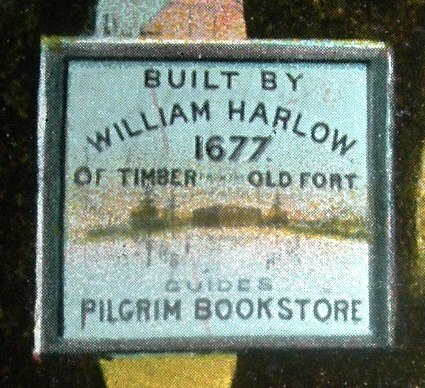 I knew there had to be a bookstore in Plymouth with the Pilgrim name at some point in history. It's just too obvious a choice. 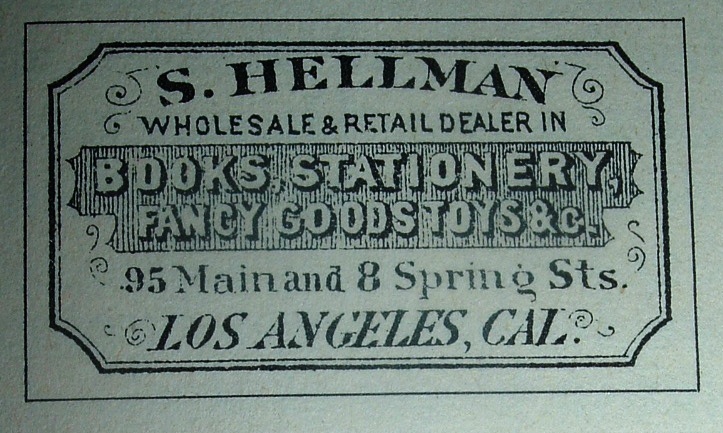 The bookstore was run by publisher and bookseller, A.S. Burbank (1856-1946), and was known for its pilgrim and Plymouth souvenirs. 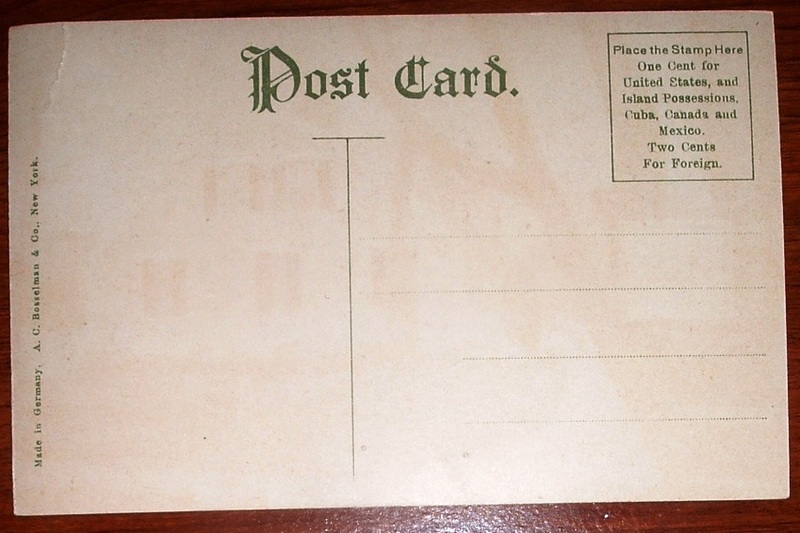 This postcard was made in Germany and distributed by A.C. Bosselman & Co. in New York. 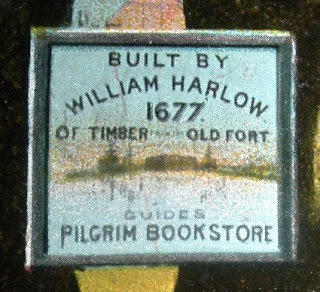 It is likely a Plymouth/Pilgrim souvenir postcard that Burbank stocked in his store, not a depiction of the actual bookstore. What is depicted is an old house built in 1677 by a William Harlow, as stated on the postcard. Further, the house is referred to as "Old Fort" and that the timbers from the old fort were used to build the house. That "Old Fort" was the pilgrims' first fort built in 1621 and presumed to be the site of the first Thanksgiving feast held in the fall of that year. 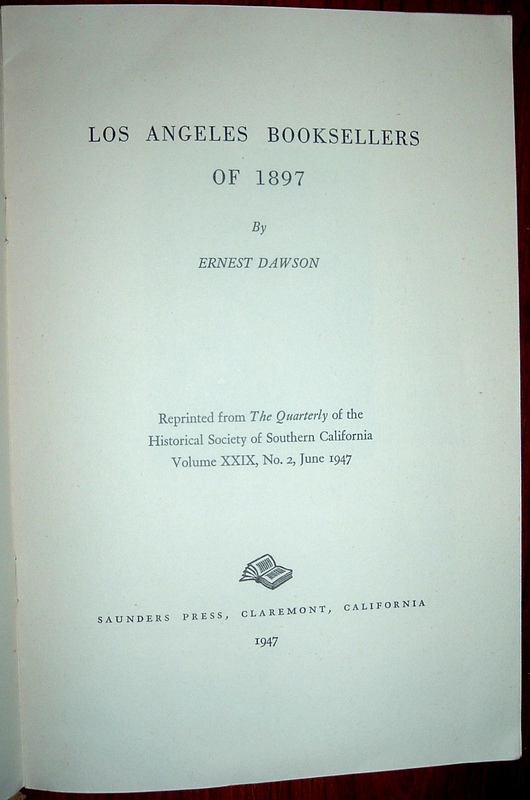 Los Angeles bookseller, Ernest Dawson, wrote an article in 1947 for The Quarterly for the Historical Society of Southern California--Los Angeles Booksellers of 1897 (Volume XXIX, No. 2, June 1947). 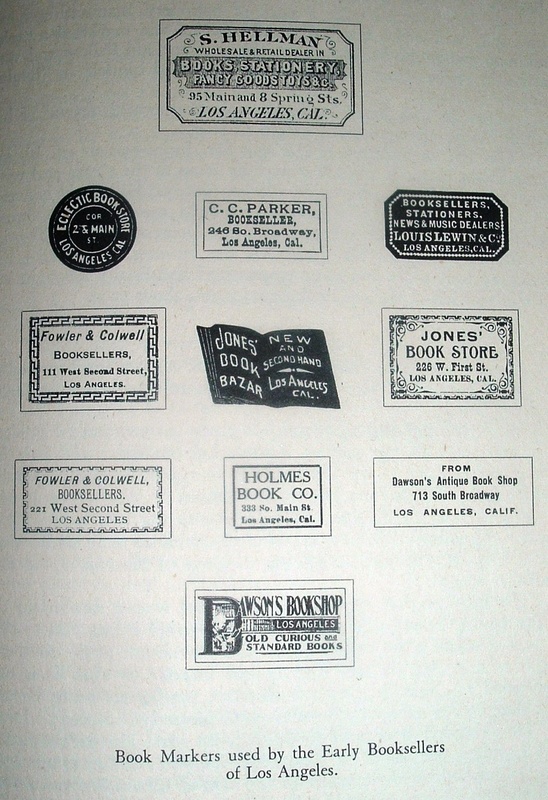 That article was reprinted that same year in the 12-page booklet below, by Saunders Press in Claremont, California. The Saunders Press, by the way, was operated by Ruth Thomson and husband Lynne Saunders. Getting a bit off topic, researching Saunders led to this interesting article on the history of women in printing. Ruth Thomson Saunders also designed bookplates, some of which are featured in Knox College's The Art of The Book exhibit. Back to the Los Angeles booksellers... 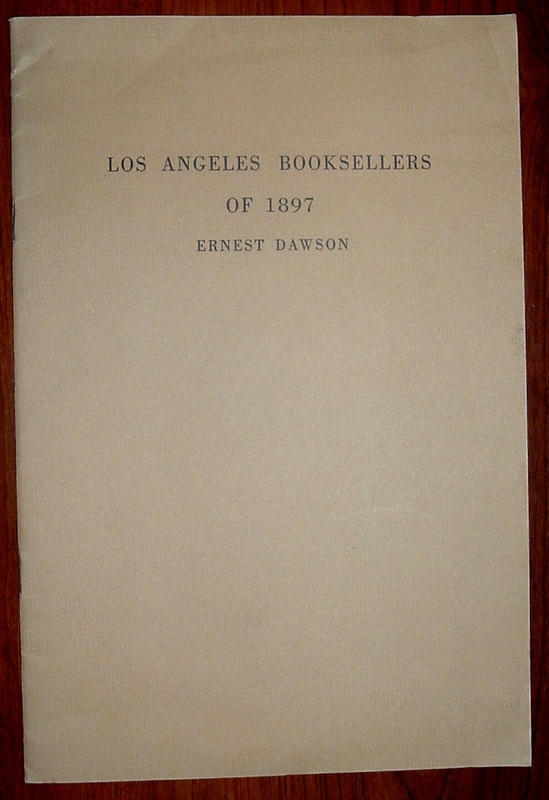 In 1947, the author, proprietor of Dawson's Book Shop in Los Angeles, took a look back at the bookselling scene in Los Angeles as it existed when he first arrived in that city in 1897. 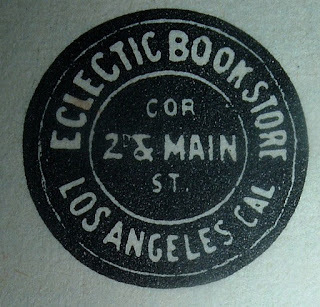 He states in the opening paragraphs that Los Angeles had at that time "three good new bookstores and three secondhand bookshops with creditable stocks." 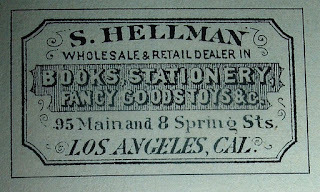 Dawson's article includes whom he supposed to be the first bookseller in Los Angeles--Samuel Hellman, who opened a book and stationery store in 1862. 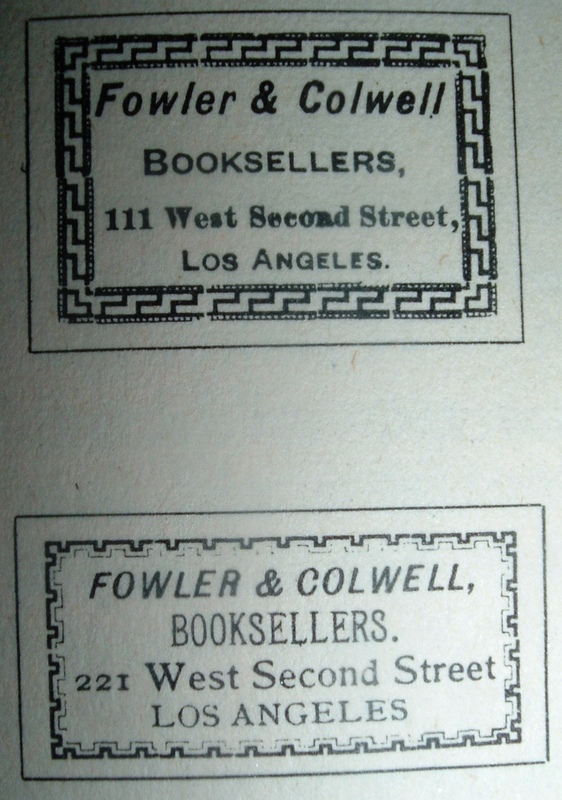 The article then goes on to list prominent booksellers in the city: C.C. Parker, Stoll and Thayer, and Fowler Brothers (all of whom had the "good new bookstores"), and Jones' Bookstore, J.W. 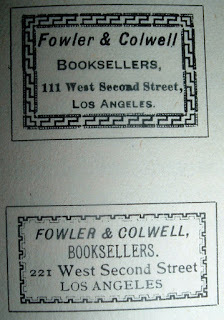 Smith, and Henry Ward (the secondhand booksellers). 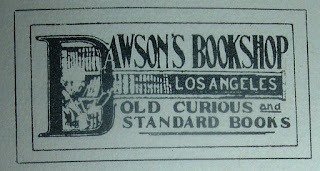 Dawson worked for the latter, Henry Ward, when he first came to Los Angeles. 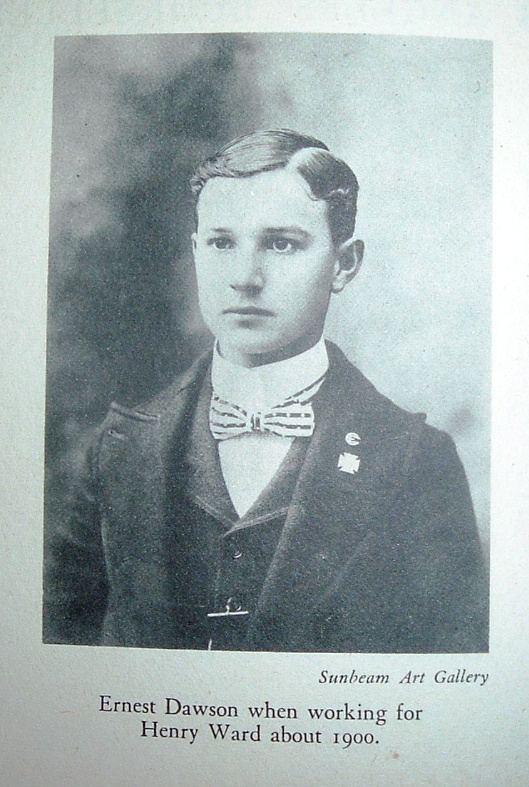 The photo above indicates he was still with Henry Ward in 1900. 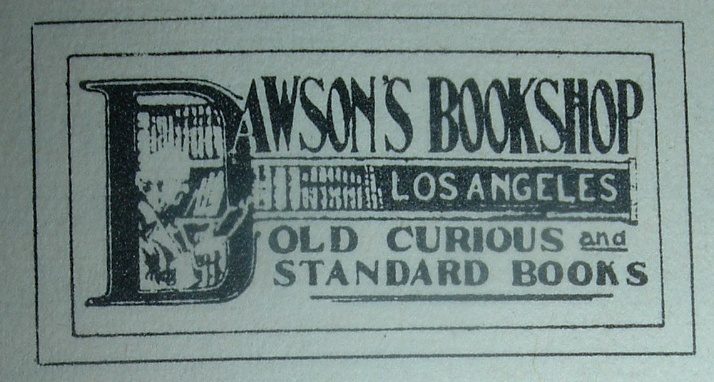 For each bookseller, Dawson offers bits of bookseller biography and bookshop history. 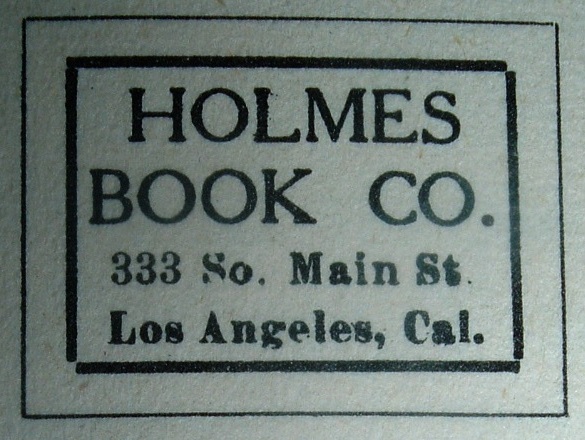 He provides illustration in the form of the booksellers' labels that were affixed to the endpapers of their books for advertising. 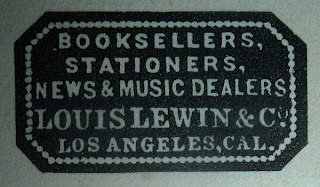 These labels, referred to also as tickets, are stamp-sized pieces of paper I like to feature from time-to-time on this blog, so I was pleased to find images in this booklet of the old Los Angeles booksellers (the labels don't necessarily date to 1897), including some that did not make Dawson's "top six" and one from Dawson's own book shop, which he started in 1905. As always, when discussing book trade labels, please see the Seven Roads Gallery of Book Trade Labels site. Color examples of some of the above are cataloged there. 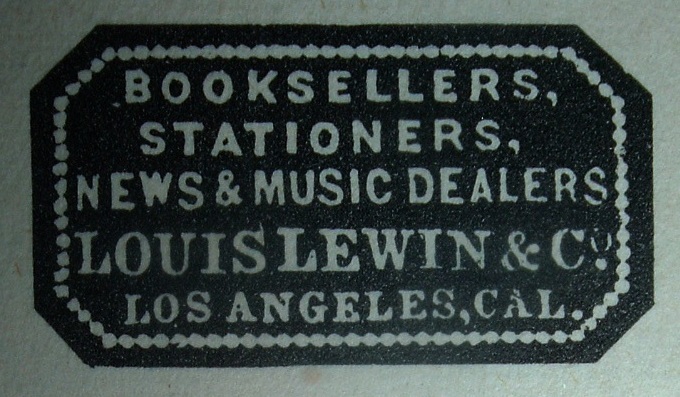 Also, Gabe Konrad's new site, www.booksellerlabels.com is a great source of information on the subject. 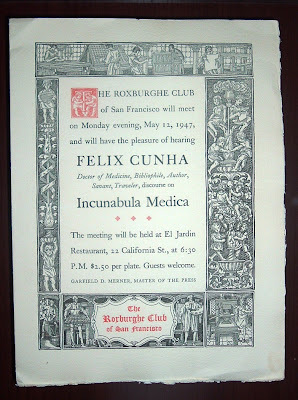 Here's a letterpress print announcement from Herbert Fahey for the Roxburghe Club in San Francisco in 1947. The announcement, with an attractive border of antiquarian images of printing-related scenes, is for a presentation by Felix Cunha titled, Incunabula Medica. Cunha is described as a "Doctor of Medicine, Bibliophile, Author, Savant, Traveler." 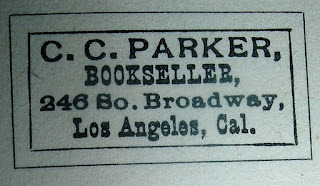 The printer Fahey, whose name appears on the back, was active in the book arts in California, having served as president of the San Francisco Club of Printing House Craftsmen in 1929. 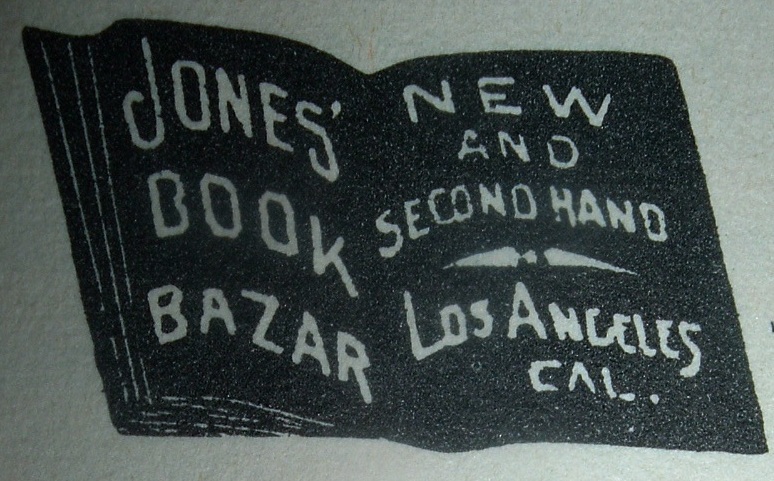 The Book Club of California also published his book, Early Printing in California: From Its Beginning in the Mexican Territory to Statehood, September 9, 1850 (1956, printed by the Grabhorn Press). I would assume he might have also been a member of the Roxburghe Club, which was formed in 1928 in San Francisco. What I know about Felix Cunha is pretty much what is printed on the announcement about him. As a bibliophile physician with an interest in medical books, he collected among other subjects, the work of Sir William Osler, a founding professor at Johns Hopkins Hospital. A 1987 issue of the Osler Library Newsletter confirms Dr. Cunha's interest in the writing of Dr. Osler, noting that Dr. Cunha's collection of Osleriana had been sold to the Woodward Biomedical Library at the University of British Columbia. Osler, in turn, had an interest in the early printing history of medical books and wrote about that history in Incunabula Medica: A Study of the Earliest Printed Medical Books, 1467-1480. 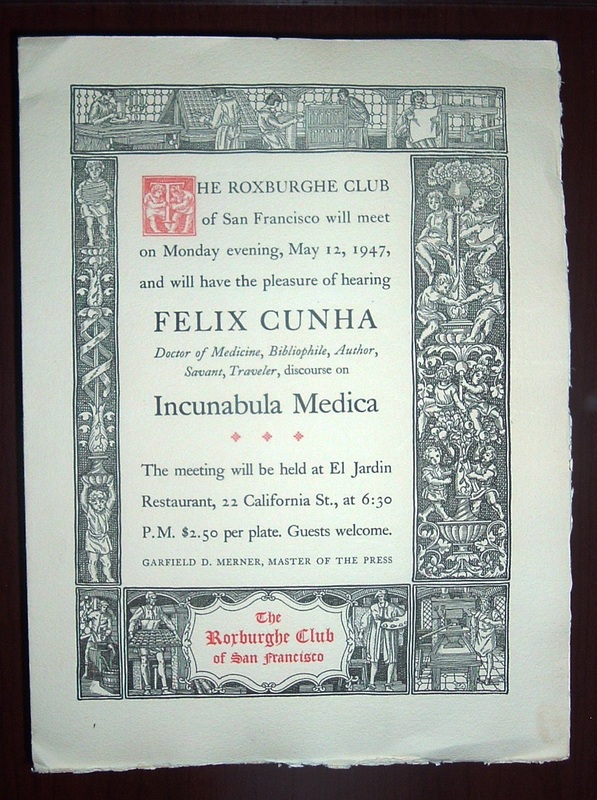 With that bit of information, one might wonder if Dr. Cunha was lecturing to the Roxburghe Club back in 1947 about an interest in incunabula medica that he shared with Dr. Osler, or was he talking that night about Dr. Osler's book? Regardless, it's likely that Dr. Osler's book found its way into the presentation. Given Felix Cunha's interest in medical history subjects, it seems only natural that he would pen a few books and articles himself, a list of which can be found here. Thanks to William R. "Bill" Holman for donating this Roxburghe Club announcement to my collection.